When other bars just won't do. The Flyer Handlebars from Biltwell are suited perfectly for your Harley-Davidson pavement-pounding freedom machine. Get a set of Flyers on your motorcycle and ride the wave. What the hell are we talking about? Who knows. I absolutely love these bars. They are an easy install and only took a little elbow grease to get in. I put them on my 2017 Iron 883, and it gave it a much better look than the stock bars. I will say that you will need to get a new, longer brake cable if you get these bars though, so it added just a bit more work. I am very satisfied with them and the craftsmanship is awesome! Put them on my Thunderbird Storm they look and feel great! Biltwell 1" flyer bars are great!!!! I put the Flyers on my daily ride, a 2002 honda shadow sabre. 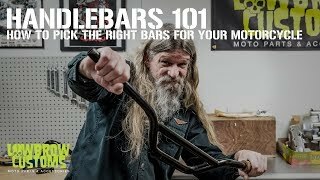 I ride about 60 miles a day back and forth to work and these bars are very comfortable and give a nice aggressive look without a punishing ride. Im working on an ironhead bar hopper right now and am looking forward to trying a new set of biltwell breezer bars on it.